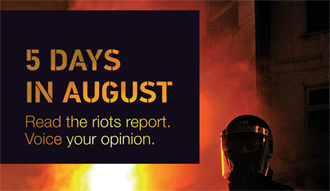 Aggressive and excessive advertising lay behind part of last summer’s unrest across the UK. So says the report by the Riots Communities Victims Panel out today (have a read here).The report’s findings are backed up by an Ipsos Mori survey (ht @marketing week) in which 85% of respondents felt that advertising puts pressure on young people to own the latest products, and 70% believing that the amount of advertising aimed at young people must be cut. The thing is that the advertising is merely the outward symptom of a wheezing type of retail that has lost any sense of place, point and reality. The ‘character’ referenced in the report, long left retail as anonymous owners liquidated all the good stuff for the next quarterly bump. And with the good stuff evaporated, we’ve been left with a desiccated retail sector that is stuck in reverse and that knows nothing other than subterfuge, agression and blandness. You want to dole out lobotomies? Fine, just don’t be surprised when you get ransacked. These shops were not targeted for being ‘part of the system’ a la G7 protests. Rather, big retail’s mores came back to bite them. Their humdrum goal of making their ever-diminishing margins on shifting low-end products using the latest techniques in must-have marketing to ensnare their victims has a consequence. More shoes? Yes, You need them! Clothes? Get more! And they are so cheap! Mobiles? You must have the latest! In the end this toxic little arrangement ruptured. Big retail doesn’t want your respect, it doesn’t want to know you, it doesn’t want to nurture your dreams, guide you through the challenges of life, connect you with likeminded souls. It wants your pennies, then it wants you out of the door, receipt and bag full of the type of sham-fulfillment it thinks you deserve for being so stupid. Well this can change. That is unless of course you want to hire more security and take a hit on insurance premiums when you get intermittently looted on high streets perma-drained of custom, bereft of joy and seething with anger. There is another way. We have been talking about it for a while. It involves a bit of courage, determination, imagination and a touch of love. Imagine a high street or shopping mall that competes, bustles and vibrates on new currencies of creativity, experiences, collaboration and learning. It’s easier to make happen than you might think. Just take a look at a tiny fraction of the radical innovators on our Retail Reset blog that are transforming the edges of retail with these new currencies. Terminal decline or some new thinking, it’s your choice. For now, for a quick and easy way to see where brands stand take a look at the advertising that surrounds you as you move about for the rest of this week. Is it agressive or just lame? Or does it (shock) have a point? If you want, do take a pic and share it on twitter with the hashtag #retailreset and we will pool a few and see what we think. The lobotomy economy is over, it’s been found out. It’s retail reset time.